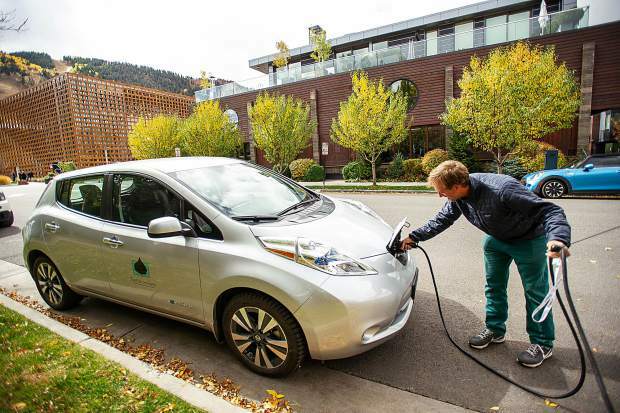 Chris Menges, Climate and Sustainability Analyst/Planner for the City of Aspen plugs in one of the city's electric cars into a charging station on Spring Street on Friday afternoon. The city of Aspen is making small, calculated moves in its march toward 2020 when the community will have reduced its local greenhouse gas emissions by 30 percent below 2004 levels. That is one of many goals laid out in the city’s Climate Action Plan (CAP), which was adopted by elected officials in February. It also targets 2050 when 80 percent of the 2004 baseline should be reduced. But that can only happen if all of the actions in the CAP are implemented and current efforts to reduce energy are increased, according to city officials. Out of 250 actions identified by a 40-person committee of regional experts, 46 of them are prioritized for the next three years in order to meet the first major goal in 2020. They span across the most significant greenhouse gas emission sectors — the energy supply, residential and commercial energy, transportation, waste and the landfill, and aviation and the airport. The plan builds off of the Canary Initiative, which was established more than a decade ago. In that time, the community reduced its greenhouse gas emissions 7 percent, which is fairly significant considering the growth Aspen has experienced during that time, said Chris Menges, the city’s climate and sustainability analyst. “That’s an indicator you are doing well if you can lower your emissions while still growing,” he said. Other signs of success are holding traffic patterns to 1993 levels and the city’s electric utility going 100 percent renewable three years ago. Aspen Mayor Steve Skadron said he’s proud of the staff, community and previous city councils for staying committed to that goal. Moving ahead, the CAP holds onto those accomplishments and also considers new technologies that deliver results in reducing the carbon footprint and growing that sector of the economy. “(The plan) helped me understand the relationship between our most significant commercial sectors and (greenhouse gas) emissions, and the necessity to view sustainability through an economic lens,” Skadron said. Acknowledging that 56 percent of the community’s greenhouse gas emissions come from energy use in buildings, the city is exploring ways to reduce the need for natural gas. In last month’s presentation to Aspen City Council focused on “strategic electrification,” a memo from Ashley Perl, the city’s climate action manager, said that if the community is dedicated to reducing its carbon footprint, more homes and buildings need to be powered by renewable electricity. That also means using electric appliances as a replacement for natural gas ones. Whether the city will require that in commercial and residential buildings in the future hasn’t been discussed. Strategic electrification is what Menges calls a capacity building idea that city staff needs to understand better before any policy discussions take place. If it works in city-owned buildings, it could eventually be written into the city’s municipal code, he noted. Menges said while a lot has been accomplished and Aspen now serves as a model for climate action, the playing field is much different today than it was in the mid 2000s when the first plan was adopted. The previous plan went for the low-hanging fruit with things like energy efficiency programs for homeowners and supporting mass transit to get cars off the road. Today’s CAP is much more robust, looking at energy storage, state policy and de-carbonization of the energy supply, to name a few. The city is part of a state coalition that has a lobbyist working pro bono at the state legislature, focusing on initiatives like clean car policy. Regionalism and partnering with entities like Holy Cross Energy and the Community Office for Resource Efficiency will advance many of the initiatives in the CAP, Menges said. The city is working with Holy Cross to help it achieve its goal of having 70 percent of its power supply coming from renewable sources by 2030, as well as reducing the company’s own greenhouse gas emissions by the same percentage. Currently, Holy Cross operates on nearly 40 percent renewable energy. The two entities also are working on the city’s electric vehicle charging infrastructure and assisting with solar projects in the region that could supply energy to 900 homes. Then there are the smaller initiatives that people will notice right away, like helping to pay for electric buses, or making energy efficiency improvements in the local affordable-housing stock. “I think realistically there are some that really rise to the top for implementation and others are building a foundation for the future,” Menges said. By 2020, the city’s climate action team and its partners will have data to work off of to update the goals starting in 2021. And there will soon be a baseline for greenhouse gas emissions. Menges said he will have information in the coming weeks on how much has been reduced since the Canary Initiative’s 7 percent accomplishment. He noted that the CAP has laudable goals and it will take a village to accomplish them.